Asmara (Tigrinya: ኣስመራ?) known locally as Asmera (meaning "They [feminine plural] made them unite" in Tigrinya), is the capital city and largest settlement in Eritrea. Home to a population of just over 800,000 inhabitants, it sits at an elevation of 2,325 metres (7,628 ft). The city is located at the tip of an escarpment that is both the northwestern edge of the Eritrean highlands and the Great Rift Valley in neighbouring Ethiopia. In 2017, the city was declared as a UNESCO World Heritage Site. Originally, according to Eritrean Tigrinya oral traditional history, there were four clans living in the Asmara area on the Kebessa Plateau: the Gheza Gurtom, the Gheza Shelele, the Gheza Serenser and Gheza Asmae. These towns were frequently attacked by clans from the low land and from the rulers of "seger mereb melash" (which now is a Tigray region in Ethiopia). Until the women of each clan decided that to defeat their common enemy and preserve peace the four clans must unite. The men accepted, hence the name "Arbate Asmera". Arbate Asmara literally means, in the Tigrinya language, "the four (feminine plural) made them unite". Eventually Arbate was dropped and it has been called Asmara which means "they [feminine, thus referring to the women] made them unite". There is still a district called Arbaete Asmara in the Administrations of Asmara. It is now called the Italianized version of the word Asmara. The westernized version of the name is used by a majority of non-Eritreans, while the multilingual inhabitants of Eritrea and neighboring peoples remain loyal to the original pronunciation, Asmera. Asmara started to grow quickly when it was occupied by Italy in 1889. Governor Ferdinando Martini made it the capital city of Italian Eritrea in 1897, in preference to the Red Sea port of Massawa. In the early 20th century, the Eritrean Railway was built to the coast, passing through the town of Ghinda, under the direction of Carlo Cavanna. In both 1913 and 1915 the city suffered only slight damage in large earthquakes. The capital acquired an Italian architectural look. Europeans used Asmara "to experiment with radical new designs".. By the late 1930s, Asmara was called Piccola Roma (Little Rome). Nowadays many buildings are of Italian origin, and shops still have Italian names (e.g., Bar Vittoria, Pasticceria moderna, Casa del formaggio, and Ferramenta). The Kingdom of Italy invested in the industrial development of Asmara (and surrounding areas of Eritrea), but the beginning of World War II stopped this. The United Nations Educational, Scientific and Cultural Organisation made Asmara a World Heritage Site in July 2017, saying “It is an exceptional example of early modernist urbanism at the beginning of the 20th century and its application in an African context”. In 1952, the United Nations resolved to federate the former colony under Ethiopian rule. During the Federation, Asmara was no longer the capital city. The capital was now Addis Ababa, over 1,000 kilometres (620 miles) to the south. The national language of the city was therefore replaced from Tigrinya language to the Ethiopian Amharic language. In 1961, Emperor Haile Selassie I ended the "federal" arrangement and declared the territory to be the 14th province of the Ethiopian Empire. Ethiopia's biggest ally was the United States. The city was home to the US Army's Kagnew Station installation from 1943 until 1977. The Eritrean War of Independence began in 1961 and ended in 1991, resulting in the independence of Eritrea. Asmara was left relatively undamaged throughout the war, as were the majority of highland regions. After independence, Asmara again became the capital of Eritrea. Asmara is very diverse when it comes to religion. Four big landmarks of the city are the Church of Our Lady of the Rosary and the Kidane Mehret Cathedral of the Catholic faith, the Enda Mariam Cathedral of the Eritrean Orthodox Tewahedo Church and the Al Khulafa Al Rashiudin Mosque of the Islamic faith. Christians and Muslims have lived peacefully together in Asmara for centuries. The religion with the most believers in Asmara is the Eritrean Orthodox Tewahedo Church (53%), Sunni Islam (28%) and Catholicism (19%). The towns and villages surrounding the city in the highlands are predominantly Christian (most places being all Christian). Further, towards the lowlands, a few Muslim towns and villages are found. The Asmara Synagogue is the last piece of physical evidence of the Jewish community that once resided in Eritrea. 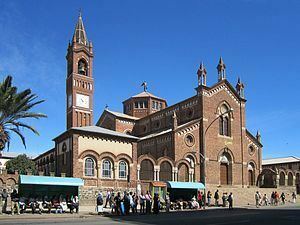 Asmara also has the St George Greek Orthodox Church, Asmara on Selam St. The city lies at an elevation of 2,325 metres (7,628 feet) above sea level. It lies on north-south trending highlands known as the Eritrean Highlands, an extension of the Ethiopian Highlands. The temperate central portion, where Asmara lies, is situated on a rocky highland plateau, which separates the western lowlands from the eastern coastal plains. The lands that surround Asmara are very fertile, especially those to the south towards the Debub Region of Eritrea. The highlands that Asmara is located in fall away to reveal the eastern lowlands, characterized by the searing heat and humidity of the Eritrean salt pans, lapped by the Red Sea. To the west of the plateau stretches a vast semi-arid hilly terrain continuing all the way towards the border with Sudan through the Gash-Barka Region. Asmara features a somewhat rare version of a steppe climate, with warm, but not hot summers and mild winters. Asmara's climate can also be considered arid to semi-arid. Due to its 2,325-metre (7,630 ft) altitude, temperatures are relatively mild for a city located not particularly far from deserts. This climate is characteristic of rainy, wet seasons and dry seasons. Asmara averages about 500 millimetres (20 in) of precipitation annually. Frost, however, is extremely rare in the city. The long rainy season of the year extends from June until September. The short rainy season occurs from March until April. On average, about 60% of Asmara’s annual precipitation is seen during the months of July and August. In contrast, December to February are typically Asmara’s driest months, where on average only 8 millimetres (0.31 in) of precipitation falls in the three months combined. Due to variable rainfall, Asmara’s climate is also characterized by drought. Several prolonged droughts in this region have occurred beginning in the 1960s and have recurred each decade since then. During periods of drought, temperatures are high and little rainfall occurs. As temperatures of a region increase, the rate of evaporation of water from the soil also increases. These combined processes result in the desertification of the soil. In order to obtain nutrient rich and moist soil for farming purposes, populations rely on deforestation to make use of the underlying ground. The most serious environmental issues Asmara faces are deforestation and desertification. Other issues Asmara faces are soil erosion and overgrazing. All of these environmental issues produce soil degradation. The city is home to the Eritrean National Museum and is known for its early 20th-century buildings, including the Art Deco Cinema Impero (opened in 1937 and considered by the experts one of the world's finest examples of Art Déco style building), Cubist Africa Pension, eclectic Orthodox Cathedral and former Opera House, the futurist Fiat Tagliero Building, the neo-Romanesque Church of Our Lady of the Rosary, Asmara, and the neoclassical Governor's Palace. The city is adorned by Italian colonial villas and mansions, one prominent example being the World Bank Building. Most of central Asmara was built between 1935 and 1941, so the Italians effectively managed to build almost an entire city in just six years. At this time, the dictator Benito Mussolini had great plans for a second Roman Empire in Africa. War cut this short, but his injection of funds created the Asmara of today, which supposedly was to be a symbol that Fascism worked and is an ideal system of government. The city shows off most early 20th-century architectural styles. Some buildings are neo-Romanesque, such as the Church of Our Lady of the Rosary, some villas are built in a late Victorian style. Art Deco influences are found throughout the city; essentially Asmara was then what Dubai is now. Architects were restricted by nothing more than the bounds of their imaginations and were given the funds to create masterpieces which we can see today. Essences of Cubism can be found on the Africa Pension Building, and on a small collection of buildings. The Fiat Tagliero Building shows almost the height of futurism, just as it was coming into big fashion in Italy. In recent times, some buildings have been functionally built which sometimes can spoil the atmosphere of some cities, but they fit into Asmara as it is such a modern city. People in Asmara dress in a uniquely Eritrean style. Asmara is also highly praised for its peaceful, crime-free environment. It is one of the cleanest cities on the continent. Asmara was listed as a UNESCO World Heritage Site in July 2017, becoming the first modernist city anywhere to be listed in its entirety. Following CARP (a World Bank initiative on Cultural Heritage), the European Union Delegation in Asmara has engaged into a Heritage Project pertaining to building's restoration and archive management. Launched in 2010 the EU/Eritrea Cultural Project was expected to be completed in 2014 (Pierre Couté - Edward Denison, Project Design Report, EUD Asmara 2009). The city of Asmara is a center for agricultural products and tanning hides. The primary industrial products of Asmara are: textiles, clothing, footwear, processed meat, beer, soft drinks, and ceramics. 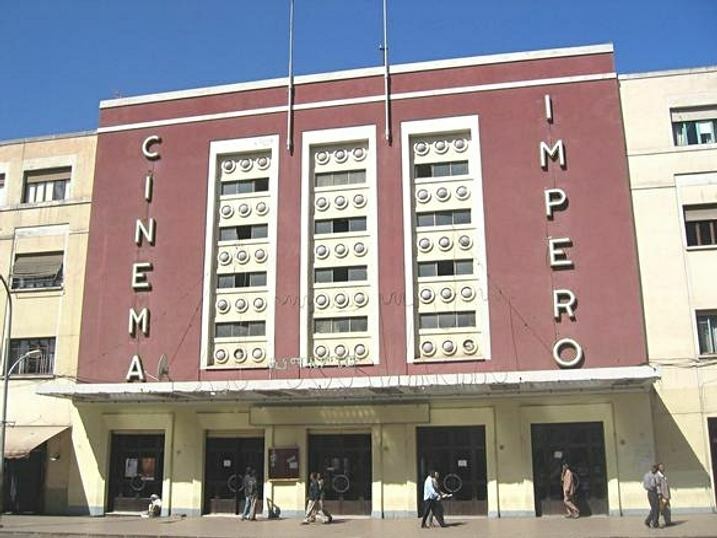 There is a railway station in Asmara that connects the city with Massawa: the Eritrean Railway, built by the Italians between 1887 and 1932, has been recently restructured. Indeed, the line has now been restored from Massawa all the way through to Asmara, but as of 2006 no scheduled services traverse the whole length of the line. The area is served by Asmara International Airport. The Asmara International Airport is the only airport in Asmara. The airport is very limited in capacity and land extent. The short length of the runways inhibits large aircraft from flying to the Asmara airport, and instead these planes must land at Massawa International Airport, located in the city of Massawa. After Eritrean independence, the roads of Asmara underwent extensive construction projects. Old roads were renovated and new highways were also built. There are only five primary roads out of Asmara, giving it its status as one of Africa’s most isolated capitals. University coursework in Eritrea is, for the most part, four years of academic study followed by one year of university national service in a relevant Eritrean Ministry. Once these five years are completed, students are then awarded their degree. So far, this strategy has been rather successful in adding to the country’s human capital. Despite challenges in trying to equally balance human resources, most Eritreans want their career to help further their country’s success. In other words, most accept their university assignment as their social obligation to serve a bigger purpose.